Back in August, Nokia announced the Symbian powered Nokia 500 smartphone. This handset runs on the Symbian Anna Operating System and it comes with a 3.2 inch display, 5 megapixel camera, 3G Connectivity, 2GB internal memory and more. Nokia 500 is the first Symbian Anna powered smartphone, which runs on the 1GHz processor. We have a good news for those, who were eagerly waiting for the launch of this smartphone. Flipkart, a popular online retailer in India is already selling this smartphone in India. If you are planning to buy one, then check out the complete specs below. Nokia 500 features a 3.2 inch display, sporting a resolution of 640 x 480 pixels, 1 GHz processor, Symbian Anna Operating System, Wi-Fi 801.11 b/g/n, 3G connectivity, 5 megapixel camera, VGA video recording, 4x digital zoom, geo-tagging and more. Other features include a 3.5 mm headset jack, 2 GB internal memory, MicroSD card slot, 32 GB expandable memory, GPS with A-GPS, Bluetooth 2.1, up to 7 hrs talk-time, up to 500 hours stand-by time and a 1110 mah battery. This handset measures 53.8 x 111.3 x 14.1 mm and weighs just 93g. Nokia 500 comes with a price tag of Rs.10,200. To buy this handset, head over to this page at Flipkart. Hot on the heels of the v25 firmware update for their Symbian^3 phones, Nokia has started rolling out a ‘performance’ pack for their handsets. As the name suggests, the ‘performance’ pack aims at improving the performance and stability of the phone and its core apps. The change-log states an improvement in the email app, improved GPS performance and ‘more’. The update is an application level update, and not a firmware level update. Thus, the firmware version of your phone will remain the same post the update. Users who have already installed the update reported an improvement in the performance of the email app, along with an overall performance improvement. The update is available via OTA (Over-The-Air) as well as via Nokia Suite. Go to the Software Update app on your Symbian^3 phone to download and install this 1MB update. This performance update is available for all Symbian^3 handsets running Symbian Anna, including the Nokia N8, C7, C6-01 and the E7. 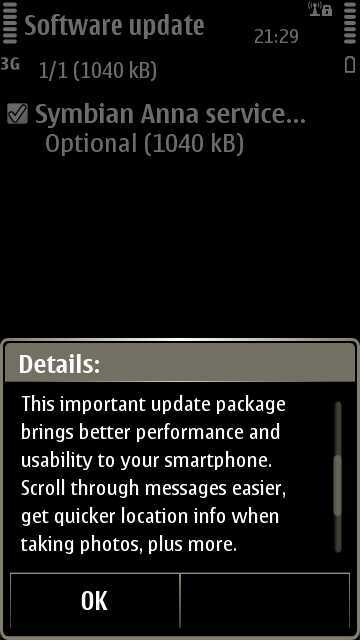 Head over to AllAboutSymbian for more information and discussion about this ‘performance’ update. Nokia N8 Symbian Anna Update Imminent! Nokia will finally started rolling out the much-awaited Symbian Anna update for its camera with telephoning capabilities – the N8. The Symbian Anna update brings with it a host of changes, which will definitely be welcomed by all Symbian loyalists. First and foremost, the whole UI has been tweaked, with rounded and larger icons, so as to make it more touch friendly. Other than the new icons, there is also a new and much improved web-browser on-board. While the browser is not up to Android or iPhone level, it still is pretty good. The Anna update will also bring a portrait based QWERTY text-input system for the N8. There will also be a ‘split view’ text input system, when entering text in web pages and apps. The music player and the photo gallery app have also got minor UI tweaks. All other Ovi apps on the phone like Ovi Maps, Music, and Ovi store have also been updated to the latest versions. At the moment, the firmware is listed in NaviFirm, which means that Nokia will start rolling out the firmware any moment now. Hopefully, the Anna update for other Symbian^3 based handsets like the E7, C7 and C6-01 will also be released soon. All Symbian^3 owners need to make sure that they have Ovi Suite v3.1.185 or above installed, for the update to show up. Nokia has just released its first ever Symbian powered handset packing a 1GHz processor the Nokia 500. However, the 500 is not a high-end handset, everyone expected it to be. It is just a mid-range Symbian phone, with a 1GHz CPU. The 500 sports a measly 3.2-inch capacitive touch screen with nHD (360×640) resolution. At the back of the 500 is a 5MP full-focus (EDoF) camera. Sadly, the handset lacks an LED flash and a front-facing camera. Other key features of the phone include Wi-Fi b/g, Bluetooth 2.1, FM radio, microSD card slot, 3G/HSUPA and GPS with A-GPS. The Nokia 500 runs on the latest version of Symbian, Anna, which features an improved web-browser and other UI enhancements. Like other Nokia handsets announced recently, the 500 also comes with Nokia Maps pre-loaded with free walk-&-drive navigation. The 500 is also capable of playing back music for up to 35 hours! The Nokia 500 will be available in most regions of the world from the beginning of third quarter of this year. The handset will be available in black and white color, with user replaceable back covers of different colors. By the end of the year, the 500 will be available in more c0lors including purple, azure, blue, pink, red, orange and dark silver. The handset is expected to cost â‚¬150 before taxes and subsidies. The official press release from Nokia does not state whether the 500 packs in a GPU, or not. It may very well be possible that Nokia ditched the GPU on the 500, in favor of a faster 1GHz processor. The Nokia X7 is not a ground breaking phone, but it is the first device to ship with Symbian Anna / PR2 (officially) on it. Unfortunately it’s also the only device that has actually begun shipping, except for the exclusive pink N8. Symbian Anna brings many welcomed changes that legacy users have been clamoring for. The interface has changed slightly, thanks to a new icon format and inclusion of the Nokia Pure font. The photo gallery and camera interface took a serious overhaul while the browser received a performance bump but still remains ugly and borderline unusable. Read on for a mini-review on the X7. Nokia has just announced via their Conversations blog, that they will be rolling out some new features via Software updates to Symbian S60v3.2 and S60v5 based handsets. The software update will update the age-old and snail-paced internal browser to v7.3. It is the same version of the Nokia web browser, which ships with Symbian Anna phones. The updated browser will bring faster and smoother web browsing performance, support for International Domain Names (IDNs), along with support for non-ASCII letters such as Arabic or Chinese. Apart from the updated web browser, the update will also include the latest version of Nokia Maps a.k.a Ovi Maps. For non-touch based Symbian handsets, Ovi Maps 3 SR4 will be installed. This new version of Ovi Maps offers indoor positioning via Wi-Fi, and travel and recommendation services like Lonely Planet. For touch based Symbian handsets (S60v5), Ovi Maps 3 SR6 will be included in the software update. Along with the above said features, this version of Ovi Maps will also add public transport lines and check-in services to popular social networking sites. Last but not the least; the software update will also add emoticons support. Nokia will roll-out all these new features for a bunch of touch and non-touch based Symbian handsets via a firmware update. Nokia has already started rolling out the firmware update for the Nokia 5230 and 5235. Updates for other handsets are also expected to follow soon. Speaking at the launch, Viral Oza, Director Marketing, Nokia India Private Limited,said, With the launch of two new devices on the exciting new Symbian Anna, we aim to further consolidate our leadership position in the Indian smartphone market. With the Nokia E6 and the Nokia X7, and a robust line up of exciting new smart devices and user enhancements coming in the next few quarters, we are confident of further strengthening our smartphone user base. Nokia E7 features a 4 inch AMOLED capacitive touchscreen display with 640 x 360 pixels resolution, 680 MHz ARM 11 processor, Symbian Anna Operating System, 8 megapixel camera with dual LED flash, HD (720p) video recording, Bluetooth v3.0 with A2DP, Micro USB 2.0, FM Radio, Bluetooth 3.0, A-GPS and more. Other features include a 3.5 mm headset jack,Stereo FM radio with RDS, Wi-Fi b/g/n, 3G Connectivity, 350 MB internal memory, 32 GB expandable memory, MicroSD card slot, 8 GB MicroSD card included, 256 MB RAM, 1 GB ROM, up to 450 hours talk-time, up to 6 hrs 30 min stand-by time and a 1300 mAh battery. The Nokia X7 is available in 2 different colors Dark Steel and Silver Steel. This handset comes with a price tag of Rs.22,829 (approx. $510), but you can get this handset for around Rs.21,500. Nokia is also planning to launch 10 new Symbian-based smartphones in the next 12 months in India.